When I was planning my latest ski trip, I knew I wanted to try out a new base layer. I had some old stuff that I had worn in the past, but it didn't fit well, so I wanted to try some of the newer products that were in the market. After spending some time researching, the Tesla Wintergear Compression Shirt and Pants caught my eye. The product pictures looked like regular compression clothing, but they were marketed as "winterized." I quickly learned that this meant they had a fleece lining on the inside rather than the normal compression shirt or rash guard material. Needless to say, I was curious to see how it would hold up in the cold. I decided to order the compression shirt and pants and test them in a bunch of different ways. What Temperature Range Are These Good For? Would They Be Good for a Tough Mudder or Spartan Race? Are the Pants Capri or Full Length? Are the Pants Flexible Enough for Cycling? Should You Wear Underwear The Pants? How Are These Different Than Regular Compression Shirts? Most importantly, I thought the Tesla Wintergear was extremely effective at keeping me warm in cold weather. It's the warmest piece of clothing I own by weight. I would rather go outside in just my Wintergear compared to some of my 100% cotton hoodies. As I discovered during some of my testing, you'll only want to get this if you're actually doing stuff in the cold. I wouldn't recommend getting one for regular trips to the gym, unless of course your gym blasts the AC. It keeps you far too hot for anything indoors or in the summer time. For milder activities, they can be worn on their own. For the activities done in the extreme cold, they need to be used as a base layer. If you want to learn more, keep reading to check out answers to common questions and the details of everything I did in the shirt and pants. Based on the activities that I did in them, I would say that you wouldn't want to go much below 30 degrees Fahrenheit with them on their own. Anything colder than that, then it's best to layer them with something else on top. As a base layer, you can probably sustain pretty low temperatures in these as long as the rest of your gear is warm enough. I haven't tried it myself, but I've seen reports of people using them below 0 degrees. They worked great for me at 20F. The gear is extremely good at wicking away moisture, so I think it would work extremely well for any obstacle course races. Even if you get liquid or mud on you, it's not going to stay on your skin for very long. I sweat pretty hard under all my ski stuff and ended the day completely dry. The pants are full length. On myself, they end just after the ankle and above the foot, resulting in complete coverage of the lower body. I did both kickboxing and grappling in the pants and experienced no issues with movement constriction. They would be great for cycling in cold weather. There's no fly on the pants; you need to remove them or pull them down to use the bathroom. Should You Wear Underwear with The Pants? In my opinion, I prefer to wear a pair of thin moisture-wicking underwear under these. But they are also tight enough to where they can be worn completely commando. I would not recommend wearing any cotton underwear or boxer shorts, as it would completely defeat the purpose of keeping you dry. Not only that, but they would be far too bulky and likely to bunch up under the pants. The main difference between winterized compression shirts and regular ones is the fleece lining. All the ones I've seen have been made from 87% polyester and 13% spandex or elastine. If you didn't know, elastine and spandex are the same thing. However, it is important to note that all of the regular compression shirts I've seen were made from the exact same material and ratios (87% polyester and 13% spandex). I don't really notice much of a visual difference when I have two laid out side by side. It's not until you put a winterized compression shirt on that you can really tell that they're two different things. 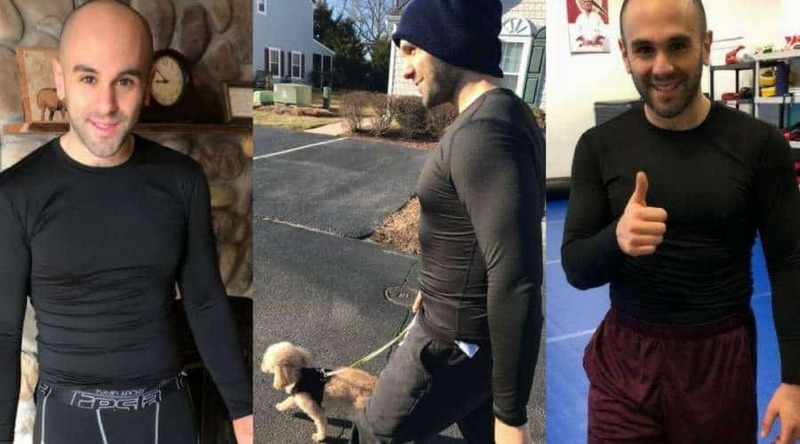 Before I get into the different activities that I tried in the shirt, let's cover exactly what a winterized compression shirt is supposed to do. Both of these things are uncomfortable and will make you even colder. Hence that phrase "cotton is rotten" which is popular among many cold-sport athletes. Extra Layer of Insulation: If you're jogging in the cold or going skiing or snowboarding, a normal compression layer just won't cut it. Not only do many of them not cover your entire arms, but they are extremely thin and not fun to be out in the cold with. Most winterized compression shirts will be long sleeved and have an extra layer (typically fleece) that will allow your body to retain more of its heat. During this research process, I noticed two common issues throughout all of my best picks: size and fitting. This is a common issue among all compression clothing, not just the winterized variety and not reserved to one brand specifically. I went with a large, because that is the size I usually wear. I'm around 5'9" and 190 pounds, and the shirt fits how I would want it to. For most people, I don't think sizing presents a major issue. However, it comes to light specifically in these products because they are so tight. If you get the wrong size, it either won't fit or won't be as tight as you want it. If you want to be extra cautious, you can look at size charts if they're available and do some measurements. When I first opened the shirt, I was a bit surprised at how it felt on my fingertips. As I felt the inside of the sleeve, I thought it felt just like a normal, non-winterized compression shirt. I thought maybe I got shipped the wrong one. However, when I put it on my body, I immediately noticed it was different. The inside of the shirt felt far more "fleecy" than normal. It felt like a combination between a regular compression shirt and the outside of my North Face fleece. Quite hard to describe actually. I wouldn't say it was more or less comfortable than any other compression shirt I've worn in the past, just different. Some people might describe it as a bit more "cozy," but it's still not something I'd want to wear lounging around the house. But then again, neither is any compression shirt. Lounging is the one area where cotton excels. 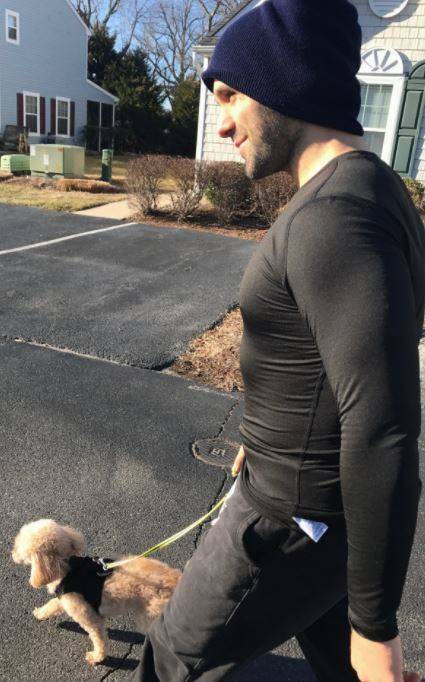 So the first thing I did when I got the shirt was take my dog for a walk. It was 33 degrees Fahrenheit outside, so I figured it would make for a great trial run. To make the test reasonable, I wore the shirt by itself with nothing but some sweatpants, shoes, and a hat. I wanted to see how warm my upper body got without any other jacket, fleece, or sweater on. Walking the dog in my Tesla Wintergear. It kept me comfortable and warm. When I first walked outside, I felt a rather chilly gust of wind. Wearing nothing but my Tesla Wintergear shirt and pants (under my joggers), I was a bit skeptical that it was actually going to keep me warm. However, I think the initial cold I felt was mainly from the adjustment of going inside my warm house to outside. After a few minutes, I was actually quite surprised with how warm I felt. It was quite an odd feeling, wearing such a thin shirt and feeling so warm, even when the wind was whipping around. As the walk progressed and I was about 15 minutes in, I was warm all around. The only thing that felt a little bit of chill were my arms. I'm not sure why, but it wasn't drastically uncomfortable. By the end of the 35 minute walk, I felt a bead of sweat pooling up on my back. I would expect this if I was running, but I don't really ever sweat when I'm doing a brisk walk, especially not in 33 degree weather. Needless to say, I was quite impressed with how warm I was kept by such a thin shirt. Had I put a light fleece on over the shirt, I am quite confident that it would have been far warmer than wearing a regular t-shirt and a hoodie. One thing to consider is that I was walking during this test and not running. I did this purposefully because I actually find it really easy to run in the cold. Not that I'm a great runner or anything, but just that I warm up really quickly when I'm doing a moderate activity like that. Bottom Line: This first test was a good indication to me that the hype behind winterized compression shirts was real. When I first got outside, I wasn't sure what to expect, but by the end of the walk, I was convinced that the technology worked well. 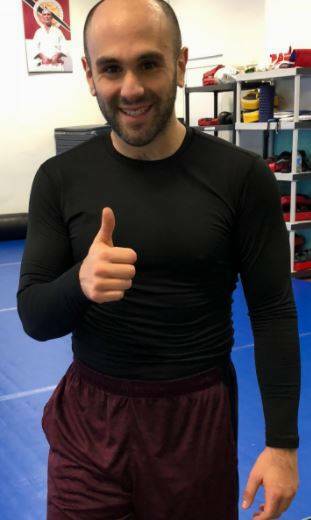 A few mornings during the week, I go to a moderately intensive kickboxing class and train jiu jitsu (grappling - kind of like wrestling for those who have no idea what it is) afterwards. When I do this normally, I typically wear a normal compression shirt or rash-guard. Here's a picture of me after a kickboxing class. Despite the thumbs up, you can see the high amount of sweat reflecting on my forehead. For that reason, I thought it would be interesting to see how I felt wearing a winterized one. During this time of year, it's usually quite cold when I walk in, especially since I'm usually the first one there. I'll typically feel pretty warmed up around 5-10 minutes of jump rope and kicking the bag whilst wearing my normal compression shirt. After that, I'm usually warm the rest of the time and ready to go. When I first walked in with the winterized compression shirt, I immediately noticed a difference. Even though the temperature was similar to most other winter days, I was feeling quite warm within just a few kicks on the bag. After about 1/4 of my total warm-up, I started feeling really hot. I didn't feel like I was going to pass out or anything, but it was uncomfortable. By the end of the 45 minute kickboxing class, I was way hotter than I normally would be. It felt like someone was blasting the heat inside the gym, even though I knew this wasn't the case. After kickboxing, I left the shirt on and continued to train in grappling. During this time, I wore a "Gi" over the shirt which is basically a heavy cotton jacket that looks like a karate uniform. Needless to say, I was quite warm, and I was wishing I had my normal rash-guard. Bottom Line: I wouldn't recommend wearing one of these shirts for indoor activities. Unless you're someone that's always cold and your gym blasts the AC, just stick with a normal compression shirt. Here's an awkward picture of me before putting the rest of my gear on in the ski house we rented. 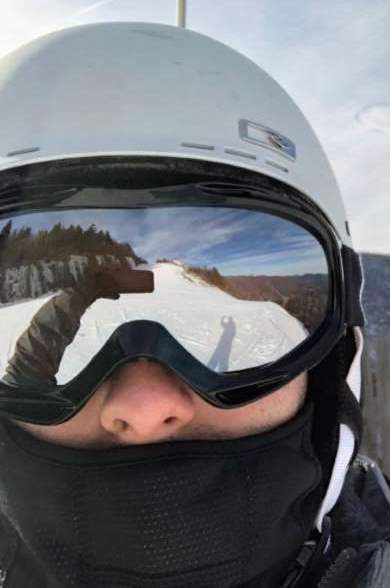 My final activity for this first test phase was skiing. In my complete guide to keeping warm on the slopes, I go into thorough detail on the rest of the gear I used and why. But here, I'll just focus on the Tesla Wintergear shirt that I used as a base-layer. It kept me completely dry, even when I was skiing hard, which I loved. There was about a 3 hour period when I was just doing run after run and going pretty intensely. My wife was already inside for the day, so I was trying to get as much out of the mountain as I could without pausing when I reached the bottom. The temperature was around 20F-25F, and I didn't feel even the slightest bit cold at any point, even on the open lifts. I strongly believe that this was because of how well the shirt and pants wicked away moisture. When I went back inside and stripped my gear down, I was pretty much completely dry. I've (stupidly) skied in cotton before and recall being soaked and frozen at the end of the day. Bottom Line: This thing rocks for skiing, snowboarding, or anything cold. It's probably one of the best base layers you can get for the price. Plain and simple, the Tesla Wintergear is an excellent value and is exceptionally good at keeping the user warm during winter activities. Just don't get them for the summer or anything indoors; you'll probably find it way too warm.